Sandoz Loratadine 5mg/5ml Syrup 120ml is an antihistamine medicine to help treat symptoms of hay fever, allergic conjunctivitis and hives. 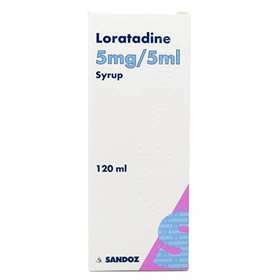 Sandoz Loratadine syrup can also be used to treat insect bites and food allergies. Children 2-12 years old body weight over 30Kg: Two 5ml spoonfuls Once a day. Each 5ml dose contains 5mg loratadine. Also contains sucrose, propylene glycol and glycerol.